China has promised to release more information on the lethal pneumonia virus that has killed more than 80 people worldwide. Deputy Prime Minister Wu Yi called for "the immediate establishment of a national medical emergency mechanism, with emphasis placed on a public health information and an early warning reporting mechanism". Ms Wu's remarks - published in the state-run media - did not make clear when the measures would be taken. But her comments follow Friday's unprecedented apology by Li Liming, director of the Chinese Centre for Disease Control and Prevention (CDC), who said there had not been "enough close co-operation with the media". China has come under fire for failing to report early and openly on the disease that emerged in the Guangdong province last November, before spreading to Hong Kong and around the world in March. A team from the World Health Organization (WHO) visiting the province has urged Chinese authorities to re-examine samples taken from victims killed by the virus - Severe Acute Respiratory Syndrome (Sars). They want to see whether the illness might involve multiple viruses or bacteria. WHO officials have told the BBC they hope to make a breakthrough on the virus in "weeks rather than months". More than half of the people killed by Sars across the world are from China. More than 2,000 people have been infected with the virus across the world. In the United States, President George W Bush has issued an executive order allowing the forced quarantine of patients with Sars if deemed necessary by the health secretary. 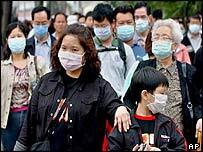 The WHO believes the epidemic Guangdong appears to be under control while an outbreak in Singapore could be almost over. But it is still spreading with Malaysia reporting on Saturday the first suspected death related to the disease. In Hong Kong, which is next to Guangdong, health officials say the rate of increase in cases has been levelling off - but there were three more deaths on Saturday. But correspondents say Hong Kong remained concerned about further spread because of the important Ching Ming festival on Saturday, when thousands of residents traditionally go to southern China to visit ancestors' graves. Experts have found more evidence that the bug can be spread easily. Five of the 24 Sars cases in the southern Chinese city of Foshan examined so far by a WHO team were caught despite the patient having no obvious contact with an infected person. I believe that much of the reporting has been alarmist. Nearly 700 people in Hong Kong have been affected, but that is less than 1/100 of 1% of the population. Scientists now believe that, in some cases at least, the "infectious agent" involved can be spread either through airborne droplets - or perhaps linger on objects such as door handles. Researchers first believed that only "close contact" - such as being sneezed on by a sufferer - could spread the infection. If another route of transmission is confirmed, it could yet make it far tougher to halt the outbreaks in China and elsewhere. The mystery virus has travelled the globe in a matter of weeks, aided in large measure by international air travel. "What is unclear is the nature of the virus"